I’ve learned the hard way that horror just isn’t my genre; I like my scares to be psychological and mind-twisting rather than blood-spattered and WTF. The Lost, by Sarah Beth Durst, was described by the publisher as “sci-fi literary/fiction,” so I couldn’t help feeling tricked once I realized it was really horror fantasy, which means “supernatural and bloody things will happen and there will be no logical explanations forthcoming.” On the plus side, it’s written by an award-winning YA author, so that should at least mean a sprightly pace and a memorable main character, right? Lauren is adrift in life: working a bill-paying job she doesn’t care about to help pay the medical bills for her sick mother, who has moved in with her. Wanting to clear her mind and avoid more bad news about test results, Lauren impulsively takes a wrong turn on her way home and drives straight out into the desert to clear her thoughts. But by the time her gas tank is empty, Lauren realizes she’s in real danger: lost in the hot desert, far from any place she recognizes, and unable to contact anyone for help. So far, a plausible and scary situation that could happen to anyone. Then, of course, it gets weird. After a freak dust storm, Lauren finds herself at the edge of a small town called “Lost,” where she immediately has some unsettling encounters with creepy locals. Lost is quite literally the final resting place of all misplaced and abandoned objects — and people. Nobody can leave until they figure out what they’ve lost (or who has lost them) and somehow get it back again, with the help of some supernatural creatures who visit every now and then. Most of the residents are downright hostile to Lauren, and she doesn’t want anything to do with any of them, either. But a mysterious tattooed man named Peter, and an eerily violent little girl named Claire, agree to help. As Lauren discovers more about herself and why she might have been brought to Lost, she is torn between her desire to go home to her mother and her new friends who need her help. Speaking of being tricked, it turns out that this is actually the first part of a TRILOGY (another YA bait-and-switch that I’m getting really tired of), and the publisher isn’t currently planning to put out the last two volumes. So even after plowing through to the end, I was nowhere close to getting a resolution. The slow pace and lengthy descriptions meant that not very much actually happened in this book — definitely not enough to require two more books to finish telling the full story. I quickly got bored of characters throwing around names like “The Finder” and “The Missing Man” with little to no explanation, and scene after scene of oddball characters doing weird things and delivering annoyingly obfuscating dialogue. The disjointed and nonsensical feel was much like playing a video game — or rather, watching someone else play a video game, which is a lot less fun. 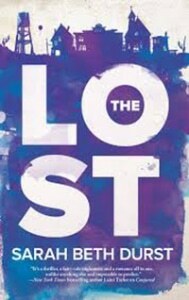 If you enjoy sinister, supernatural settings and don’t mind a slow-moving plot, you might feel right at home in Lost. Lauren is a sympathetic and likable protagonist, and it’s easy to share her fear and frustration as she tries to make sense of what’s happening to her. And the descriptions conjure up a haunting and sadly beautiful place where abandoned and neglected things end their days. Personally, though, I’ve got better places to be.